A new item I am introducing this year is a 'Blog of the Month' feature. At the beginning of each month I plan to showcase a blog that I consider to be of special interest to the ceramic community. The first of these I am featuring is that of my friend and colleague Eugene Hon. This blog not only illuminates details of his process but also its archival and exploratory value for the research of his many projects. Those things that inspire or interest him are shared in a wonderfully informative way. 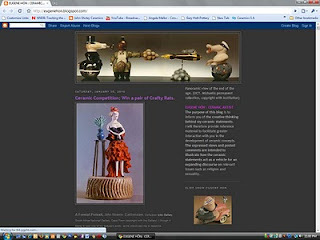 His blog is crammed with items of value and examples of his exceptional drawings which direct his ceramic projects, as well as images of finished works and what it is that informs them. I feel that he has truly created a blog both brave and inspirational in concept, and well worth a visit to anyone wanting to get an insight into what Eugene's creative process encompasses. hi john, great idea... blog of the month and what a perfect selection to start with. i love eugene's blog, his process, his research, his insight and especially his drawings. You are so kind Mr Shirley - thanks for your encouragement and support. Much appreciated. As mentioned on my blog's birthday entry - without your introduction to blogging and constant technical advice this would not have been possible.